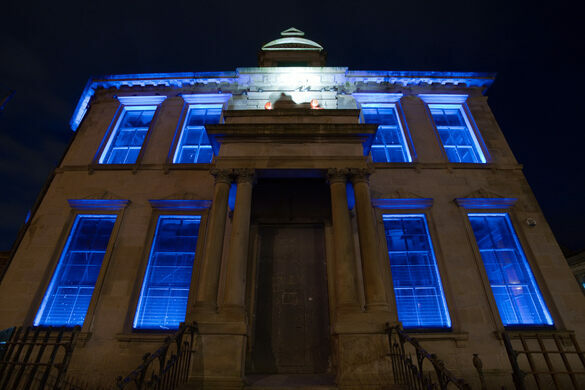 A community's effort restores the historical Maryhill Burgh Hall. In 1878 the original Maryhill Burgh Hall opened as a result of the town’s increasing population growth and the lawlessness that naturally ensued. The building included necessary police accommodation, a court room, and a public hall with 900 seats. In 2012, the hall was restored after more than seven years of developing proposals and raising €9 million by the Board of Trust. The world's oldest surviving music hall was also once a freakshow. Glasgow’s piece of the patron saint of love. Hidden in a Scotland museum is a copse of extinct tree stumps. The renewed hall now provides the local community with a modern public hall, a café and heritage exhibition space, 11 offices, a commercial and community recording studio, nursery and meeting rooms. The renovation upholds the building’s historic merit by returning a series of twenty unique stained glass panels which depict the trades and industries of 19th century Maryhill. The original panels were designed and made by Stephen Adam, and were stored by Glasgow Museums. Ten brand new stained glass windows have been added to represent modern Maryhill. Over 200 locals helped conceptualize and design the new additions. The hope is that the new windows will become a permanent legacy of the Burgh halls just like the original glass from 1878. Daily tours are available along with daytime café hours and event bookings. 200 year old collection of oddities and medical paraphernalia. An icon of the Battle of Britain is frozen in flight inside a grand Victorian museum. An incarceration museum on the spot of possibly the oldest prison in England. A seven-century-old jail tells a not-so-pleasant history of crime and punishment.